MUTOKO, Zimbabwe, Nov 1 2013 (IPS) - Ranganai Zimbeva, from the rural village of Mutoko, which lies about 200 km northeast of Zimbabwe’s capital Harare, plugs his ears with his fingers and shakes his head as he watches miners close to his village blast the hard rock to extract the black granite within. Deep and wide gullies have replaced the rolling pastures in this village in Mashonaland East Province where thriving livestock once roamed freely. It is difficult to see the blue skies as grey dust formed from the explosions billows upwards to fill the skyline. “Some who go to the clinic with breathing problems have been told that their illness is caused by inhaling too much dust or smoking. The mining companies should set up a health fund to ensure villagers get sufficient treatment,” 70-year-old Zimbeva told IPS. But the cattle deaths, which happen every year, are not frequent. And Zimbeva and the people of Mutoko have no proof about what causes this – many do not have the money to seek veterinary assistance. People here are poor and have been experiencing worsening hunger due to the recurrent drought. “We have less cattle now because this black granite [mining] has taken away the grazing land. Worse still, [the mining companies] have turned a deaf ear to our requests for them to employ our sons and daughters, choosing to take people from other areas instead,” said Zimbeva. About 10 companies, which are both local and foreign owned, are extracting granite from this rural district. The contact details of some of these mining companies are obscure and difficult to obtain. While IPS was able to make contact with a representative from one of the mining companies involved, they refused to comment. Geologists say that Zimbabwe holds some of the richest mineral deposits in Africa, including platinum, diamonds, asbestos, graphite and gold. But activists and economists accuse some indigenous and emerging mining companies of not improving the welfare of local communities and leaving them worse off than before. Independent economist John Robertson explained that emerging mining companies, which the government is heavily involved in, were different from multi-nationals that tend to cater for the welfare of local communities. “Some of these multi-nationals have management teams running the equivalent of municipalities, complete with hospitals, schools, housing schemes. This is where they differ from the indigenous and emerging extracting companies where rules don’t seem to apply and greed rules,” Robertson told IPS. For families who once lived on the Marange diamond field in Manicaland Province, which is estimated to be about 71,000 hectares and thought to hold about a quarter of the world’s diamond deposits, the compensation offered to them by mining companies for relocating has not been sufficient. About 693 families, who had lived for decades on the diamond fields, were moved to a derelict farm called Arda Transau, which is near Manicaland Province’s main town, Mutare. A total of 4,300 households have been identified for relocation. While Arda Transau has now been developed and families have been given four bedroom houses as compensation for the loss of their homes, this is seen by many as inadequate. “The expansion of mining activities in Marange has claimed much of the land used by locals for subsistence, [and also] community infrastructure, such as dams, that provided water for market gardening. Small business such as shops and stalls were closed down,” Melanie Chiponda, the director of Chiadzwa Community Development Trust, a lobby group promoting the rights of local villagers whose communities border the mining field, told IPS. “The mines have created a dependency syndrome among the households. They are hardly involved in corporate social responsibility activities and the people are secondary. It is all about profits and never the people, who are incapacitated to negotiate for better arrangements,” she said. Chiponda said people were worse off since they had been relocated as they mostly lived on food handouts from humanitarian agencies and on donations from the mines. She added that a large number of children dropped out of school and are helping to support their families by selling firewood. Freeman Bhoso, the executive director at the Zimbabwe Natural Resources Dialogue Forum, a non-profit advocacy organisation seeking to promote the sustainable extraction of the country’s resources, told IPS that because mining concessions were granted behind closed doors, it left loopholes that made communities vulnerable. “The way in which the concessions are granted by the government is wrong because it excludes communities. There is no transparency and it seems they are given along politically partisan lines. In most cases, environmental impact assessments are done well after mining starts,” he said. A report released in June this year by the mining parliamentary committee, accused the ministry of mines and mining development of granting licences to companies to mine at Marange without fully disclosing how this was done. 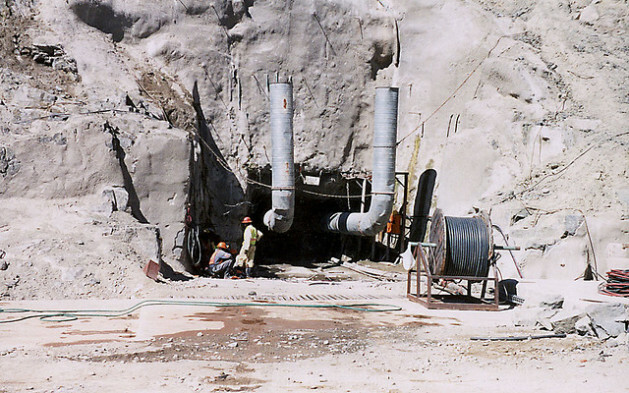 The report states that the government parastal Zimbabwe Mining Development Corporation (ZMDC) has joint ownership of three of the companies operating at the Marange diamond field. The ZMDC also owns 100 percent shares in another mining company operating at Marange. Former deputy minister of mines and mining development Gift Chimanikire, from the Movement for Democratic Change, refused to comment on the mining companies that the government had a stake in. He told IPS he was no longer part of the government following his exclusion from a cabinet formed after President Robert Mugabe won the Jul. 31 election. Ministry of mines and mining development officials referred questions to the current minister, Walter Chidhakwa. But he did not respond to calls. In 2011 and 2012, mining companies in Zimbabwe exported diamonds worth a total 797 million dollars, yet only 82 million dollars was remitted to the treasury. Bhoso accused the companies of failing to distribute money from the community share ownership trusts announced by the government. According to Zimbabwe’s Indigenisation and Economic Empowerment Act, foreign-owned mining companies are required to transfer 51 percent of their shares to locals. This money was meant to placed in the community ownership trusts and distributed among affected communities. “The main problem is that the government is heavily involved in these joint ventures and operations tend to take a political dimension,” said Bhoso. This is not a good situation for the people of Zimbabwe. We have mining in the US, coal, nickle, silver, and the like, and have encountered similar problems. Coal mining has cost the lives of thousands when explosions occur or cave-ins are experienced that take the lives of miners and leave their families without that male figure of husband, father, or son. It is very hard work, it is dirty, it poses respiratory issues for the miners, and for the wives doing the laundry as they encounter second-hand coal dust. About the only mining I have viewed extensively is that of salt mining. The owner of this type of mine has it down to a science. It is fruitful, worth the investment and seems a much cleaner type of mining as opposed to the others. Stringent rules must be set between the mining corporations, the miners, and the people who would experience the outcome of mining as well as their animals. There has to be an accountability of actions and the mining corporations need to be held accountable to primary and secondary outcomes from their mining efforts in order to keep it clean, safe, and tolerable to all.